Abstract: Resilience in children is the ability to recover from traumatic experiences and develop the skills to overcome future challenges. In dealing with adversities, children draw from personal strengths often divided into external (I have), internal (I am), and interpersonal (I can) resources. Refugee and internally displaced children can develop these personal resources through meaningful participation in issues that affect them, their families, and their community. Meaningful participation is upheld by the UN Convention on the Rights of the Child which views children’s voice and active involvement as key to realizing their fundamental rights. Child participation is enhanced through the six step Child-to-Child approach, which allows children to study and analyze the issues that confront their community and plan and carry out age-appropriate actions in response. Child-to-Child has been successfully implemented in more than 70 countries worldwide with children living in difficult circumstances, such as camps for refugee and internally displaced persons, and with children living in less dire conditions. The London-based Child-to-Child Trust promotes meaningful child participation in health, school-readiness, Disaster Risk Reduction, HIV/AIDS, climate change, inclusive education, and other issues affecting children. Recently an Office of the Americas was created to develop a network of Child-to-Child programs in Latin America and the Caribbean. Keywords: Child-to-Child, child participation, building resilience, child rights, empowerment, refugee children, internally displaced children, disaster risk reduction, natural disasters and children, children in camps, psycho-social support. Foremost among the vulnerable and victims in the chaos and destruction of war, civil unrest, and natural disasters are children and youth. Children under age 16 comprise up to 50% of the inhabitants of refugee and IDP (internally displaced persons) camps where they frequently arrive separated from family and loved ones. In their homes and en route to the camps, the children are exposed to enormous physical and emotional harm and incomprehensible violence, often upon their own parents and other family members. Arrival in the refugee camp or shelter frequently results in another set of difficulties, such as food insecurities, limited educational opportunities, inadequate psycho-social support, and reduced space to play. The familiar village and family structure that brought security and community cohesiveness is fractured and not easily supplanted by camp leadership and NGO services. Responding to the need to provide psychosocial support for emotionally traumatized children is a relatively recent phenomenon. Reviewing approaches to psychosocial support work in international humanitarian assistance, Zaveri (2011) found that a lack of consensus on what should be included delayed the insertion of standards on mental health and psycho-social support in the earliest Sphere Handbooks published in 1998 and 2000. Zaveri noted that efforts have been made recently to provide such support, although not systematically and not tapping into the affected community as a potential resource. The Child-to-Child program views children as a resource to help meet the psychosocial needs of other children and families living in difficult circumstances. The incorporation of the Child-to-Child approach in refugee camp activities and projects has been shown to be effective in helping restore the emotional and physical health of affected children and families and in building their resilience (Harman, Scotchmer,1997). Child-to-Child’s core principle of meaningful participation maintains that children can and should be actively involved in improving their own situation and that of their family and neighbors. This paper will argue that the success of Child-to-Child methodology with children living in refugee and displaced persons’ camps and other difficult circumstances underscores the importance of rights-based participation of children in issues that affect them, and will demonstrate that meaningful participation helps build resilience in children, especially those who have experienced traumatic events. Article 12 of the UN Convention on the Rights of the Child (CRC) recognizes as fundamental the right of children to freely express their views in all matters that affect them. The Committee on the Rights of the Child considers this right an underlying principle that must inform the implementation of all other rights. According to Gerison Lansdown (2011), the rights addressed in Articles 13-17 (freedom of religion, conscience, association, privacy, and information) fall into the broader category of “participation,” which in turn represents the key to realizing children’s rights. In promoting children’s rights-based participation, the CRC addresses the evolving capacities of the child and challenges parents and guardians to provide direction and guidance as children grow and acquire critical thinking skills and competencies. Lansdown notes the benefits of child participation as providing insight that helps inform child-focused legislation and policies, and empowers children by allowing them to acquire skills and experience. Participation also leads to better protection, as the children are less likely to be silenced. Finally, participation promotes civic engagement and active citizenship, enhancing good governance. For over thirty years, Child-to-Child has upheld the active and meaningful participation of children as outlined in the UN Convention on the Rights of the Child. The methodology promotes meaningful child participation through child-centered, active learning approaches that engage children in education, health, and development issues. Implemented in venues as varied as schools, markets, camps for displaced and refugee children, faith centers, and centers for street children, Child-to-Child provides the opportunity for children to study and analyze the issues that confront them and their community and then plan and carry out age-appropriate actions in response to that issue. Child-to-Child approaches promote active “learning” and “doing” using a unique, six-step action-learning cycle which links learning to life. Using the approach, children promote health and wellbeing to other children and adults in ways that are appropriate to children – through songs, skits, games, and other creative, sustainable, and replicable ways. Such methods also have enormous appeal to adults as well, as child-led plays and other activities are welcome entertainment for everyone, especially in the bleak environment of a refugee or IDP camp. In this manner, Child-to-Child provides an effective method of transmitting important health and safety information to the entire community. Beyond just the transmission of information, however, children act upon the knowledge they have gained. In their homes and schools, older children promote hygiene, child safety, and other key messages to their families. Empowered by the experience of linking the acquisition of knowledge with an action, children then seek to address other issues that affect them. Children who see a positive reaction to their call to participate in a vaccination campaign, for example, may decide to raise awareness and take action on another identified issue such as school accessibility for their disabled friends. In empowering children to act as agents of change, Child-to-Child helps children identify issues and actions they can take to affect the conditions in which they, their families and their community live. Child-to-Child employs a methodology that allows the children to set the agenda by stating and prioritizing those health and well-being issues that concern them the most. By naming the issues they will study and deciding upon the follow-up action, the children become owners of the program. Many of the themes selected are traditional health issues, but often children’s concerns reflect poverty, substance abuse, violence, and the breakdown of family and community. Safety problems range from the prevention of accidents to landmine awareness. Actions such as teaching through songs, skits or puppet shows require few resources and tap into the children’s creativity as they compose catchy health tunes or create puppets from discarded plastic bottles and other available materials. Older children have taught numeracy skills to younger children with stones and bottle caps and literacy skills through rhyming games. Child-to-Child promotes “finding out activities” which encourages children to study the extent and effect of a named issue in their community. 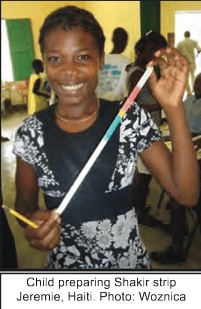 For example, when studying about nutrition, children are guided in the creation of colorful Shakir strips that they then use to measure the upper arm circumferences of their younger siblings and friends between the ages of one and five. Child-to-Child is inherently sustainable because once the children understand the approach, the steps can be repeated for new and different issues and eventually handed down to the next generation through peer education. It does not require expensive, externally sourced materials or resources, only those that can be found locally cheaply or for free. The Child-to-Child Trust has pioneered, tested, and promoted a range of practical and effective “child-to-child” approaches to facilitate the participation of the most marginalized and disadvantaged populations of children. The Trust’s mission is to encourage and enable children and young people to promote the holistic health, education, well-being and development of themselves, their families and their communities worldwide. To this end, the Trust has developed resources and materials and provided training to systematically develop adults’ capacities to support the participation of children living in difficult circumstances, including those in refugee camps, street children, displaced and unaccompanied children, children affected by war (including child soldiers), and children affected by HIV/AIDS. Over the past 34 years, Child-to-Child has spread to over 70 countries worldwide and impacts over a million children annually. The Trust oversees an international network of expert advisors and Child-to-Child practitioners and works through both local partners in-country and large international organizations such as UNICEF, PLAN, and Save the Children. The Trust maintains a copyright-free, open-source strategy in regards to the use of its publications and resources in order to assure maximum impact and dissemination of the Child-to-Child approach. In 2012, the Trust authorized the establishment of a subsidiary office in Chicago, Illinois, USA with a goal of developing and promoting a linguistically competent network of Child-to-Child (Niño-a-Niño) programs in Latin America and the Caribbean. Linked closely to the Trust in London, Child-to-Child of the Americas builds upon over thirty years of successful implementation of Child-to-Child programs in Latin American countries such as Nicaragua, Ecuador, Bolivia, El Salvador, Mexico, Haiti and among Hispanic children in Chicago, USA. Efforts are underway to develop new programs and partnerships and identify existent Niño-a-Niño programs currently not part of the network. In 1994, a Child-to-Child program targeting unaccompanied Rwandan children was initiated in the Ndosho refugee camp in Zaire. (Eunson, 1995) The impetus was an epidemic of bacillary dysentery that was affecting hundreds of adults and children, resulting in severe dehydration and death. Traditional health education methods taught by health professionals were not successful. Camp health officials decided to incorporate Child-to-Child methodology, teaching older children how dysentery is spread, treated, and prevented. The older children worked with health officials to compose a simple rhyme with key health messages. The children then taught the messages to younger children, adding dance and drum accompaniment when possible. In an event that was both informational and social, the children put on a concert featuring songs with the health messages, teaching in a manner natural to their culture and easy to understand by the younger children. Within a few days after the concert, the incidence of new cases of dysentery began to decrease sharply and never reached epidemic proportions again, despite the nearly 1000 children in the camp who had not yet been affected by the disease. After the concert, camp officials noticed small groups of children sitting together and drawing in the dirt or on paper. Older children were teaching younger children basic reading and writing, and peer groups were working on remembered schoolwork. Empowered by the success of the dysentery song campaign, the children began to address another issue they faced – lack of schools. A Child-to-Child program was initiated in Bhutanese refugee camps in Nepal in 1994 at the urging of teachers who had been exposed to the methodology while still in Bhutan (Kattel, Carnegie,1997). The program was seen as providing a method for linking learning in the school with life in the camp and helping to build community by establishing bonds among children and camp sectors. Teachers were trained in the methodology, lesson plans developed on health and personal and environmental hygiene, and the program was implemented in seven camp schools. By 1996, however, Child-to-Child activities decreased as trained teachers moved away and schools found the program hard to implement among other academic priorities. Camp leaders decided to try a different emphasis, providing a voice to children in light of the Convention of the Rights of the Child (CRC). Through Child-to-Child workshops based on the CRC, the children identified problems, possible solutions, and suggested actions. The children named issues broader than health, ranging from inadequate space for play to discrimination against girl children and drunks disturbing the children’s studies at night. Children’s clubs and forums were established outside of the school day and Child-to-Child became a focal point for camp leadership to coordinate and facilitate children’s activities based on the children’s input. Concern Liberia developed a Child-to-Child program in 2005 in IDP (Internally Displaced People) camps in Monrovia and other outlying regions to improve the health of children and families (www.concernusa.org ). Children between the ages of 10 and 14 were trained in basic hygiene techniques such as washing hands after using the latrine and covering food to keep insects away. They spread their messages in the camps using drama, song and bi-weekly health talks. Camp officials noticed a reduction in common ailments such as fevers and diarrhea. Officials also noticed that camp hygieneimproved as well, as children were teaching about the dangers of dumping garbage and fecesin living areas. Surveys conducted by Concern staff indicated that the children had a morepowerful impact on changing the habits of the community than did outside health workers. Child-to-Child’s strategy of linking the acquisition of knowledge with action has also been useful in post-disaster situations and in helping displaced children recover physically and emotionally. During and immediately after disasters, children have helped other children reach safety or stayed with them until help arrived. After the emergency needs have been met, children have shown an innate ability to provide comfort and support to other children experiencing trauma. In many cases, a child has been able to “cocoon” another child until adult help is available. Spontaneous, child-led responses to another child’s traumatic experiences often reflect children’s unique role – to be a playmate and friend. Children notice when a friend is sad or withdrawn, and can reach out to play with that child or help that child get the assistance he or she needs. Effective implementation of child participation methods in Disaster Risk Reduction has been seen in many parts of the world (Plan, World Vision,2009). Giving voice to children through Child-to-Child programs in post-disaster situations helps decrease displaced children’s sense of powerlessness and lack of control, especially when the program incorporates efforts to involve children in risk avoidance and disaster risk reduction. Rather than be viewed (or viewing themselves) as victims of a disaster, children can be pro-active agents to address the impact of natural disasters, especially in light of climate change. Child-to-Child’s “finding-out” activities regarding the effect of climate change on disaster risks help the children plan mitigating responses, such as identifying risky areas, safe routes to safe areas, and planting trees to reduce the risk of erosion and flooding. By reviewing disaster risks, as well as the risks faced by children in their daily lives, children can become increasingly active in controlling their environment. Children living on the streets, in disaster-prone or violence-torn areas, or in other difficult circumstances are constantly aware of the dangers they face. Child-to-Child helps them prevent, or at minimum prepare for, these dangers through activities that increase their self-confidence and promote mental health and well-being in otherwise disempowering circumstances. There is compelling evidence that using Child-to-Child with children in difficult circumstances leads to increased self-efficacy, empathy, improved decision making, and other life skills. A longitudinal study of the Child-to-Child approach in Pakistan’s Health Action Schools program (Carnegie, R., Khamis, T.,2002) demonstrated that empowering children to make their own health decisions in consultation with adults, adopt health-promoting practices, and carry health messages from schools to families and communities not only improved their health knowledge and behavior but also enhanced their self esteem. Child-to-Child’s commitment to giving voice to children, creating respectful and safe spaces, and maintaining open agendas allows for children to talk about whatever is concerning them. Often children move quickly to difficult topics and worries about home and family life. Many of the activity sheets created by the Trust help children discuss difficult topics and understand their feelings and the feelings of other children. Sharing their stories with other children and adult support can help allay fears or look for solutions. Often the children address topics through puppet shows which allow them to safely express their feelings through a third “person” and elicit responses from the audience in a similarly safe way. As described earlier, Child-to-Child is grounded in meaningful children’s participation, incorporating a six-step methodology that allows for children to have a voice in naming, designing, and implementing solutions to the issues that affect them. The ability to make a positive difference in their lives and the lives of their family and community members through Child-to-Child programs helps children overcome feelings of powerlessness in the present and gain skills towards building resilience for the future. Resilience in children is the ability to recover from traumatic experiences and develop the skills to overcome future challenges. In dealing with adversities, children draw from personal resources often divided into three areas of external (I have), internal (I am), and interpersonal (I can). Meaningful participation through Child-to-Child activities helps children develop those personal resources in uncertain and insecure environments. The solidarity and friendships developed with other children, the guidance and support of adult facilitators, and the positive affirmation of the receiving community builds the child’s external resources. Similarly, the experience of being able to express a viewpoint about a matter that affects him or her, having that viewpoint taken into consideration, and undertaking action on a specific matter strengthens a child’s internal resources. The child comes to believe that he or she is respected and responsible. Finally, children’s interpersonal and social resources are developed through the experience of looking at issues that surround them and jointly finding resources and solutions to address those issues. In this manner, children learn collaboration, communication, and problem-solving skills. 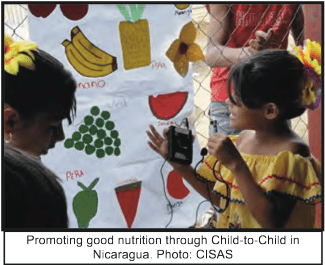 Child-to-Child (Niño-a-Niño) methodology was introduced in Latin America and the Caribbean in the early 1980s through a series of workshops and trainings promoted by the Trust. Due to the Trust’s open-access policy towards the use of Child-to-Child methodology and materials coupled with distance and linguistic barriers, the Trust has not always been aware of Child-to-Child programs in Latin America that developed over the years through an organic dissemination process. However, Child-to-Child programs in Managua, Nicaragua, and Cuenca, Ecuador have maintained a dynamic presence in the area for decades and served as collaborators with the Trust and training center for the Child-to-Child approach. The Child-to-Child (Niño-a-Niño) program at the Centro de Información y Servicios de Asesoría en Salud (CISAS) in Managua, Nicaragua began in 1983. In its thirty year history, CISAS has been a regional training center for Child-to-Child and has developed child-led programs addressing health promotion, ecology awareness, child rights, disaster risk reduction, and other issues. Based at the University of Cuenca in Ecuador, the Fundación Niño-a-Niño has promoted the Child-to-Child approach by translating and adapting materials, providing training in the methodology, and undertaking research on children’s rights and child-led responses to issues that affect children. 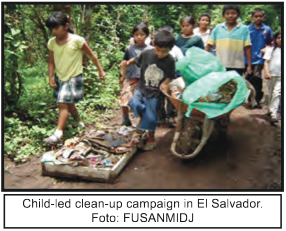 For over 20 years, FUSANMIDJ (Fundación Para la Salud Natural de la Niñez y la mujer Maura, Ita, Dorothy y Jean), located in San Salvador, El Salvador, has worked with children in urban and rural communities, promoting agriculture, nutrition and scholarship. Currently FUSANMIDJ’s Niño-a-Niño program has 325 child participants in 15 rural communities and 6 cities. La Paz, Bolivia-based Fomento al Desarrollo Infantil (FODEI) incorporated Child-to-Child methodology in a program entitled “Older Brothers and Sisters” (Hermanos/as Mayores) that over a five year period involved over 7000 older siblings who learned to promote early child development and child rights for children at psycho-social risk. Founded in response to the needs of traumatized students relocated from Port-au-Prince following Haiti’s devastating 2010 earthquake, Jeremie-based Haitian Connection’s Timoun-a-Timoun program has trained over 50 teachers and initiated 25 Timoun-a-Timoun general health and well-being programs in schools, orphanages, and markets. For more information about these programs and other Latin American and Caribbean-based programs, see the contact information listed below. Refugee, internally displaced, and other children living in difficult circumstances are at high risk for psycho-social distress because of the physical and emotional trauma they have experienced. These children, as well as children living in less stressful conditions, can benefit from programs that give children a voice and role in issues that affect them and their community. Successfully implemented in refugee camps, shelters, and a wide variety of settings worldwide, the Child-to-Child program’s six-step approach is grounded in the meaningful participation of children. Children are led through a process of identifying and analyzing issues confronting themselves and their community, and then plan and carry-out age-appropriate actions in response. The experience of active participation is key to building the external, internal, and interpersonal resource that comprise resiliency in children and promote their psycho-social recovery. Carnegie, R. and Khamis, T. (2002). “The Quest for Quality: An Evaluation of the Health Action Schools Project,” (Unpublished Report). Aga Khan University-Institute for Educational Development. Karachi, Pakistan. Eunson, P. (1997). “Zaire: Unaccompanied Children as Refugees: Protecting their Right to a Normal Development.” In Rebuilding Young Lives: Using the Child-to-Child Approach with Children in Difficult Circumstances, Six Case Studies. London: A Child-to-Child Publication. Hanbury, C. (ed) (undated). Child-to-Child and Children Living in Camps. London: A Child-to-Child Publication. Harman, P. and Scotchmer, C. (eds) (1997). Rebuilding Young Lives: Using the Child-to-Child Approach with Children in Difficult Circumstances, Six Case Studies. London: A Child-to-Child Publication. Kattel, U and Carnegie, R. (1997).“Nepal: From Health to Children’s Rights: Child-to-Child in the Bhutanese Refugee Camps.” In Rebuilding Young Lives: Using the Child-to-Child Approach with Children in Difficult Circumstances, Six Case Studies. London: A Child-to-Child Publication. Zaveri, S. (2011). Approaches to psychosocial support work in international humanitarian assistance. In Curry, J. and Horn, R. (Eds) International Psychosocial Support Programming (pp 1-15) Washington DC: The American Red Cross. Empowerment of Sustainable Communities (escomm) is Ugandan local registered NGO, We are happy to get this literature through Global Health. Thank you Celine for the good work you are doing arround the world. escomm is willing to work with you on internally displaced children in war ravaged areas in Northern Uganda, recent Flood victims in Kasese district and Land slipe displaced people in Bududa Eastern Uganda arround mount Elgon.